Canada is a country in the northern half of North America covering 9.98 million square kilometers (3.85 million square miles), making it the world's second-largest country by total area with its capital as Ottawa. 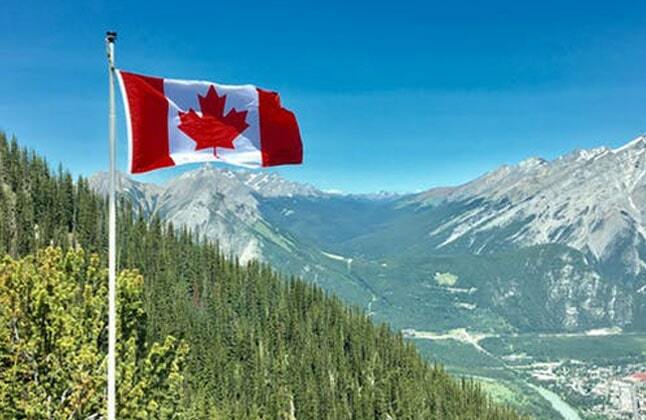 Canada is sparsely populated, the majority of its land territory is dominated by forest and tundra and the Rocky Mountains, The majority of Canada has a cold or severely cold winter climate, but southerly areas are warm in summer. According to a 2012 report by the Organization for Economic Co-operation and Development (OECD), Canada is the most educated country in the world ] the country ranks first worldwide in the number of adults having tertiary education with 51 percent of Canadian adults having attained at least an undergraduate college or university degree. Canada spends about 5.3% of its GDP on education. The country invests heavily in tertiary education (more than 20 000 USD per student).As of 2014, 89 percent of adults aged 25 to 64 have earned the equivalent of a high-school degree, compared to an OECD average of 75 percent. Established as Toronto's first public college in 1966, Centennial College offers more than 95 diploma and certificate programs in business, communications, community and health studies, science and engineering technology, general arts, hospitality and transportation. These career-oriented programs emphasize practical experience with laboratory learning, industry and agency placements, as well as co-op education. Students also prepare for college and university through the General Arts and Science program, and English language training. Humber College is one of Canada's largest community college with 27,000 full time students. The college is located in Toronto. It is a member of Polytechnics Canada and offers a broad range of career focused credentials, including bachelor degrees, diplomas and certificates. Established in 1967. It is a Public college. Humber offers more than 150 programs including: bachelor's degree, diploma, certificate, post-graduate certificate. The nearest air port is Toronto Pearson International Airport (11 mints). It has Affiliations from CCAA (Canadian Collegiate Athletic Association), ACCC(Association of Canadian Community Colleges ), AUCC(Association of Universities and Colleges of Canada), CBIE(Canadian Bureau for International Education), Polytechnics Canada. George Brown has three main campuses, all located in Canada's largest city, Toronto. The college works closely with industry leaders to ensure programs are evolving and providing students with the technical and people skills required in the workplace. In 2011, the college was rated as producing graduates with the skills employers in the Greater Toronto Area value most. George Brown College offers a wide variety of programs in art and design, business, community services, early childhood education, construction and engineering technologies, health sciences, hospitality and culinary arts, preparatory studies, as well as specialized programs and services for recent immigrants and international students. Degree programs are approved by the Ontario Post- secondary Education Quality Assessment Board. College is member of Association of Colleges of Applied Arts and Technology of Ontario, Association of Canadian Community Colleges. Located in Toronto, Seneca offers full-time, part-time and continuing education options. It specializes in programs relating to technology, business, financial services and applied arts. The college has partnerships with industry leaders and believes education should be flexible and accessible. Named as one of the best colleges in the Manitoba province and located in Winnipeg, Red River is consistently expanding and growing. The college has more than 30,000 students and 200 programs. It is the provinces largest institute of applied learning and boasts a 95% graduate employment rate. College is located in Winnipeg, Manitoba. It is a Public College. It is the Manitoba's largest institute for Applied Research Work with its major programs. College was found in 1938. Earlier when it was established as the Manitoba Technical Institute (MIT) and in 1998 it renamed as the Red River College. Low cost of living in comparison to other North American cities. Red River College hosts approximately 300 international students each year, from over 29 countries. Students in Red River College's Creative Communications program run an online radio station known as "Red River Radio". The radio station is an opportunity for students to host, program and produce both music and news/talk format radio, and features music and talk shows, as well as news, sports, and weather. McGill University is proud to offer over 250 specialized and interdisciplinary Master's and Doctoral graduate degree programs, earning its excellent reputation as one of the great centres for learning and research in North America. Graduate students make up roughly 23% of McGill's 36,500 students, and have the opportunity to work closely with world-renowned faculty members who are pioneers, innovators, designers and explorers in their fields. McGill boasts two gorgeous, geographically distinct campuses, one in the heart of cosmopolitan downtown Montreal, and one 40 km (25 miles) west on the banks of the beautiful St. Lawrence River. Dedicated to fostering the complete student experience, McGill is proud to offer a comprehensive range of award-winning student services and resources, designed to best achievement. The University of Waterloo offers a wide array of Bachelor's degree programs in the following faculties to over 35,000 students from around the globe. Located in Canada's tech center and one of the most intelligent places to live in the world, the University of Waterloo is close to Toronto. The city plays host to over 1,000 tech companies, many of which have partnerships with the school. Waterloo understands that practical learning goes hand in hand with the classroom, and beyond. The university is home to Canada's first co-op learning program which now has over 6,300 employers working with the school to give students accurate views at as many careers as possible. The co-op program has helped to foster top companies and start-ups like BlackBerry, Vidyard, and Pebble. The University of Alberta is one of Canada's top universities and among the world's leading public research-intensive universities, with a reputation for excellence across the humanities, sciences, creative arts, business, engineering, and health sciences. Home to world-leading facilities such as Canada's National Institute for Nanotechnology and the Li Ka Shing Institute of Virology, the U of A attracts the best and brightest minds from around the globe. Our students choose from 400 undergraduate, graduate, and professional programs in 18 faculties. We lead the country with the most 3M national teaching fellowships (Canada's highest award for undergraduate teaching excellence). With over 100 years of history and 250,000 alumni, the U of A is known globally for equipping graduates with the knowledge and skills to be tomorrow's leaders. The U of A is located in Edmonton, Alberta, a dynamic city with one million residents and the major hub for Alberta's thriving energy industry. The main campus, in the centre of Edmonton, is minutes from downtown with bus and subway access through the city. Home to over 39,000 students, including more than 7,000 international students from 152 countries, the U of A fosters a supportive and multicultural atmosphere within a vibrant research environment. The Sauder School of Business at the University of British Columbia is one of the world's leading academic business schools. Located in Vancouver, Canada's gateway to the Pacific Rim, Sauder provides a global business perspective at a dynamic crossroads of the international marketplace. Dedicated to rigorous and relevant teaching, our programs generate business leaders who drive change and shape industries and organizations around the world. The School maintains a worldwide reputation for excellence in research, with the Financial Times regularly ranking Sauder among the top 25 internationally for business research. Accredited by both AACSB and EQUIS, Sauder is ranked the number one research business school in Canada and is home to more than 100 world-class academics from around the globe. Our faculty enjoys international recognition for its excellence in research, teaching and outreach. In the classroom they are innovators, bringing leading-edge perspectives and the latest in management thinking to students. Sauder has a distinctly international perspective on business, demonstrated by our teaching and research activities around the globe, the diversity of our staff and students, and our international partnerships. Through our international programs, we seek to increase the opportunities available to our students to study and work globally. The University of Toronto has assembled one of the strongest research and teaching faculties in North America, presenting top students at all levels with an intellectual environment unmatched in breadth and depth on any other Canadian campus. U of T faculty co-author more research articles than their colleagues at any university in the US or Canada other than Harvard. As a measure of impact, U of T consistently ranks alongside the top five U.S. universities whose discoveries are most often cited by other researchers around the world. The U of T faculty are also widely recognized for their teaching strengths and commitment to graduate supervision. U of T attracts undergraduate, graduate and professional program students from across Canada and abroad. Our students have unique opportunities to learn from top researchers. Off campus, they can enjoy the extraordinary amenities and attractions of the Toronto region, Canada's pre-eminent urban cluster. On campus, students are able to craft intimate learning communities within a unique undergraduate college system, participate in more than 1000 clubs and co-curricular activities, and compete on a wide variety of intra- mural and inter-collegiate sports teams. Established in 1827, the University of Toronto today operates in downtown Toronto, Mississauga and Scarborough. Entrance Exams for the top 5 CANADA Colleges & Universities. "So far my experience has been excellent. Correct guidance right from the beginning has benefited me a lot. I personally would like to thank Edwise Counselors for all the efforts and guidance during my correspondence." "Thanks to Edwise I am here with the complete knowledge about the whole system and finding it comfortable." "Edwise helped me in choosing the right college and course. They have been supporting me for all the proceeding from choosing the college to departing." "It was an excellent process. Fastest visa process too. The counselor was the best at work and an amazing follow up by her." "It has been a very good experience, deciding, discussing and applying for colleges. So far a very smooth transition from one step to another." "My experience with Edwise was very nice. The cousellors helped me throughout my admission process. They did all the minors things too. I would definitely suggest Edwise to my friends who plan to go abroad for their further studies."